This is quite a special year for giving thanks. Both of us have lived on Hilton Head Island for many years and have certainly been evacuated for a hurricane a time or two, or three! But never have we felt the direct impact of a storm like Matthew. 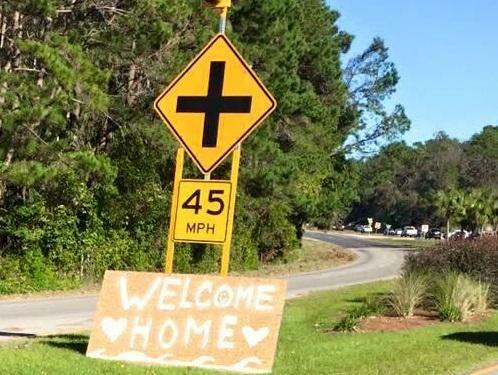 Our beautiful island lost numerous trees and some structures were damaged, but when we arrived home an awesome islander made sure we were greeted with a spray painted sign that read, “Welcome Home.” And isn’t “home” what Hilton Head Island is all about? To our owners and guests, the island is your home away from home. It is the place that you rest and relax. It’s a place that you share with family and friends and a place that always feels a part of you. It’s a place for fun, sun, and solace! To us, it is our real home and one we will never take for granted. Trees will grow and structures will be repaired. We’ve got this! So this Thanksgiving, we are grateful for our island, family, co-workers, owners and guests more so than ever before. Our beautiful island is a little bumped and bruised but we are all safe. That is a lot to be thankful for! From all of us at Spinnaker Resorts, Happy Thanksgiving!